KIEV, July 16. /ITAR-TASS/. The inhabitants of a tent camp set up on Kiev’s Independence Square dubbed as Maidan are ready to vacate the place and go to fight to Eastern Ukraine if their condition is met: the children of high-ranking Ukrainian officials must go to the war together with them, the tent camp representatives told ITAR-TASS. "We are ready to remove the tents from the square and go to the front. But we would like Mr. Avakov (Ukraine’s parliament-appointed Interior Minister Arsen Avakov) to send his son with us. And all those who are sitting at Verkhovnaya Rada (parliament) should also gather their children, and then, together, we are going to fight (in the east),” a Maidan activist said. “The protesters have been given limited time to get away from the square, take up arms and go to the front,” Avakov stressed. The minister added that Ukrainian police had complete files on everybody who was now staying on Maidan and who of them was engaged in illegal activities. “The concentration of strange and unknown people on the country’s main square is a project of the Russian Federal Security Service (FSB) and marginal parties that have become a thing of the past,” Avakov said. “It is very favourable today to blame everything on Russia while the incumbent authorities in Ukraine are inactive. 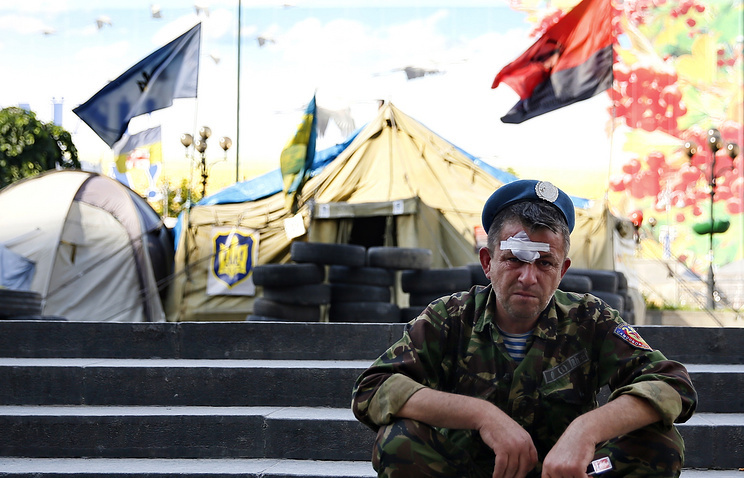 The Maidan has become a hindrance to the authorities. It prevents them from hustling their nasty and murky business, which the previous regime also did. The authorities are hiring people who are staging provocations on Independence Square to get a formal pretext to disperse us,” Roman went on to say. About 400 people are currently staying at the tent camp. They claim that they are living on donations from the residents of Kiev and guests. Indeed, urns acting as thrift boxes where people can put their money in are standing all over the square. “Maidan” has its own vegetable garden. The activists are growing cucumbers and tomatoes on the former flowerbeds…Kiev residents bring them food. Part of the protesters who used to occupy the building of the Kiev City Council has moved to live in the Himalayas restaurant of Indian cuisine on Kreshchatik Street and the Dnepr Hotel on European Square. After 16 years of operation, the owner decided to relocate the restaurant to a new safer place after it had been robbed. The activists are occupying 60 rooms on the fifth and sixth floors of Hotel Dnepr. No one knows how many people are actually staying there. The activists do not pay anything for their accommodation. The hotel administration has written letters to the State Property Management department set up under the president of Ukraine because the Dnepr Hotel is on its balance sheet but they have not received any answer. 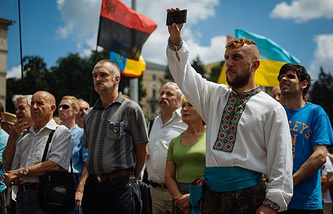 The protesters have also turned the Ukrainian House cultural center, where international exhibitions used to take place, into a dormitory for the fighters of the Kiev battalion and the Maidan self-defense force. Entrance is forbidden to ordinary people. The same is true of the Oktyabrskiy Palace. I am going to initiate an appeal to the interior minister and the chief of Ukraine’s Security Service urging them to take instant measures to resume law and order in the centre of our capital. I demand that all the seized official buildings be vacated immediately because there is an element of crime in such actions. Police will be given the right to use weapons in case of armed resistance	Vitaly Yaryoma Ukraine’s Chief Prosecutor None of the protesters seems to be willing to pull up roots and leave their comfortable and long-inhabited places. Most of them come from Western Ukraine. They have lost their jobs back home but they do not want to look for it in Kiev either. 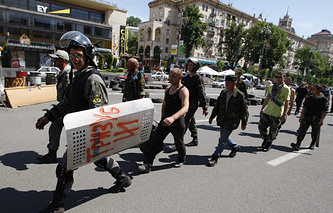 Some Maidan inhabitants make a little money by working as guards. Many drink away the money they have earned. Drunken inhabitants are a common sight on Maidan in daytime. Brawls, fights and other crimes have also become commonplace. A total of 158 offences have been committed on Kiev’s Independence Square since late February, according to Ukraine’s Chief Prosecutor Vitaly Yaryoma. Over that period of time, there have been 18 cases of infliction of bodily harm, of which 4 were lethal; more than 14 armed assaults and 73 thefts. "Facts of illegal car theft, fraud, drugs production and illegal handling of firearms have also taken place,” the chief prosecutor said. Four people were injured in a shootout on Kiev’s Independence square on July 7. 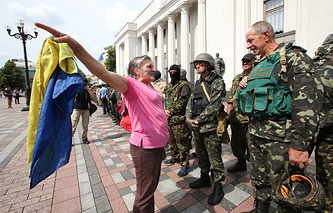 Yaryoma has demanded that protesters immediately vacate all administrative buildings downtown Kiev. “I am going to initiate an appeal to the interior minister and the chief of Ukraine’s Security Service urging them to take instant measures to resume law and order in the centre of our capital. I demand that all the seized official buildings be vacated immediately because there is an element of crime in such actions. Police will be given the right to use weapons in case of armed resistance,” Yaryoma warned.